Substance abuse counseling is an important part of long-term drug and alcohol addiction recovery. For those who struggle with drug addiction, detoxing alone will often not result in lifelong sobriety. Clients must also learn to cope with stress, manage symptoms of any co-occurring disorders, and develop healthy relationships. Substance abuse counseling can help with this phase. Counseling can take many forms, from individual psychotherapy to group therapy. Most clients will need a combination of treatment types, particularly if a co-concurrent mental illness or personality disorder is present. A substance abuse counselor is a licensed professional who specializes in treating clients with chemical dependency. Counselors work with clients and their families to address co-occurring disorders, establish healthy habits, and develop strategies for rebuilding a healthy, fulfilling life after completing inpatient treatment. Why is counseling important to addiction recovery? Drug addiction is more than a physical dependence. Clients therefore need more than physical treatment. Moreover, individuals who struggle with substance abuse are more likely than the general population to have a co-occurring disorder or to have experienced neglect, abuse, or serious trauma. Physical and sexual abuse during childhood in particular can significantly increase the likelihood of drug or alcohol addiction. Traumatic life events, such as combat exposure, surviving an accident, physical assault, or sexual violence are risk factors as well. All of these factors require dedicated treatment, making substance abuse counseling an important part of achieving lifelong sobriety. Professional counselors help clients work through co-occurring disorders such as depression or PTSD separately from their physical addiction, providing guidance, support and strategies for common challenges that clients are likely to face. Counseling also helps clients rebuild relationships with friends and family, while educating loved ones about the recovery experience. What are the goals of substance abuse counseling? At Sprout Health Group, all of our treatment programs begin with a safe and medically assisted detox. But achieving physical recovery is only the first step toward lifelong sobriety. Substance abuse counseling addresses the psychological and emotional healing that must take place for a seamless and successful recovery. Counselors work with clients to identify life goals, potential triggers for relapse, and any co-occurring disorders that may require deeper therapy or psychiatry. What are common treatments involved in substance abuse counseling? One of the most common and effective forms of psychotherapy, or “talk therapy,” cognitive behavioral therapy (CBT) helps clients challenge negative thought patterns and develop strategies to manage emotional stress from trauma, mental illness or personality disorders. 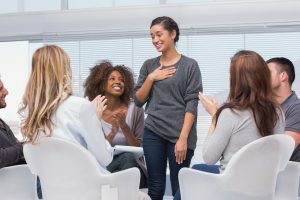 Group therapy allows individuals who have suffered from addiction to share their experiences while gaining access to essential education about drug abuse, stress management, and recovery. Sprout group therapy is led by an experienced leader who inspires engaging, healthy discussions. Family therapy is an important part of reestablishing trust and rebuilding healthy familiar relationships based on empathy and support. At Sprout Health Group, we specialize in Brief Strategic Family Therapy, an emerging, yet evidence-based approach that heavily involves the family in the resolution of issues ranging from adolescent behavioral problems to substance abuse. Because drug addiction often becomes all-encompassing, at the expense of other interests, hobbies or relationships, experiential therapy is an effective and important part of recovery. Common experiential therapies include outdoor recreation, yoga, meditation, and animal therapy, all of which release natural endorphins, which can help clients’ recovering brains. Eye Movement Desensitization and Reprocessing therapy (EMDR), another proven treatment for trauma and post-traumatic stress, helps clients remember disturbing events in a less emotionally distressing way. It is used to help clients with a dual diagnosis work through co-occurring conditions, such as PTSD. How can I find substance treatment counseling near me? If you are seeking help for an addiction or want to support a loved one in recovery, Sprout Health Group can help you find a treatment center near you that specializes in your specific recovery needs. Our treatment experts can talk you through the phases of recovery, explain the insurance process, and guide you through the differences between recovery paths. With inpatient, relaxing recovery centers located throughout the United States, we can guide you toward the best one for you. Call us today to take your first step toward recovery.